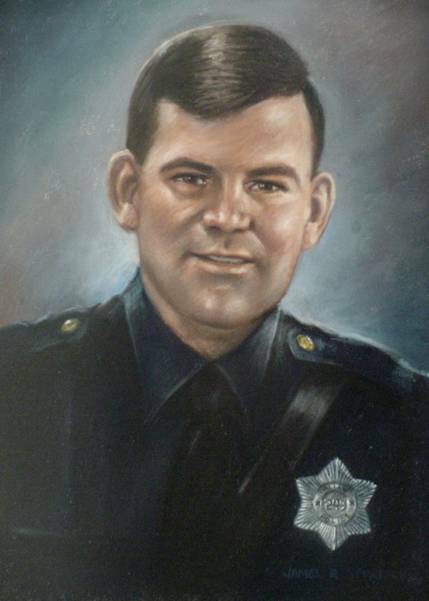 Officer Ernest Bates succumbed to injures received four months earlier when he was struck by a city bus. He was directing traffic at the intersection of Elm Street and Akard Street and was attempting to get out of the way of a car when he jumped in front of the bus. Officer Bates suffered severe back injuries but was able to return to light duty after three weeks. Two months later, although still in great pain, he returned to full duty directing traffic in the same intersection. On the evening of December 5, 1942, he collapsed while directing traffic and was rushed to a local hospital. He died while in surgery as doctors attempted to correct injuries from the original accident. Officer Bates had served with the agency for six years. He was survived by his wife and daughter. Officer Bates was my grandfather. Since he succumbed to injuries in 1942 and I was born in 1945, I never got to meet him. However, my Mother tells me what a wonderful father and friend he was. He is a hero, and I am very proud to be his grandaughter.